Hong Yik Stone Cutter started in 19th June, 1976, located in the town of KULAIJAYA, Johor bahru, Malaysia. 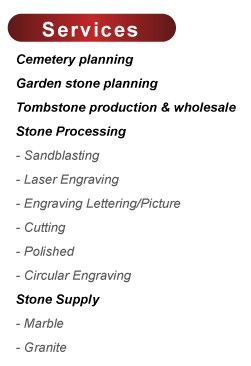 We are one of the chief granite factory in Johor state, mainly dealing with tombstone engraving works. We have more than 60 employees as at current. Our major produces are all kinds of Granite products used for Memorial Park, Monument statue Temple and big slab for Construction work.